Gracie Ferguson looks for the pass on an offensive play against Eminence. Destinee Epperson goes up for a shot against Eminence. 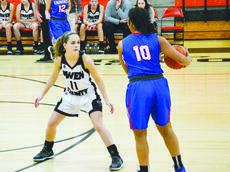 The Lady Rebels took the court against Eminence Jan. 7, for the opening night of the 8th Region All “A” tournament. The team had no trouble finding the basket, outscoring Eminence 24-8 in the first quarter. By the half, they led 42-17. 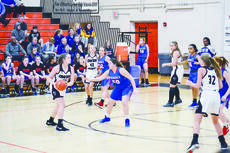 Head coach Amy Wesselman pulled from the bench early, but that did not stop the Lady Rebels from continuing its run for the win. At the final buzzer, Owen County had outscored their opponent 76-38. Destinee Epperson led the scoring with 15 points. Lexie Moore dropped 14 points and pulled down seven rebounds. Haley Young scored 12 points. Collectively Grace Ferguson, Samantha Woodyard, Destiny Goodrich, Abby Colligan, Natalie Smith and Baileigh Young added 35 points to the scoreboard. 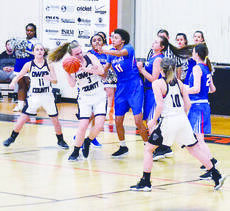 The win against Eminence advanced the Lady Rebels to the semi-finals where the team found itself lined up against its rival, Walton-Verona. Jan. 9, the two teams lined up for the tip-off. By the half, Owen County trailed by five – going to the locker room with 22 points to Walton-Verona’s 27. The close matchup continued in the second half of play. 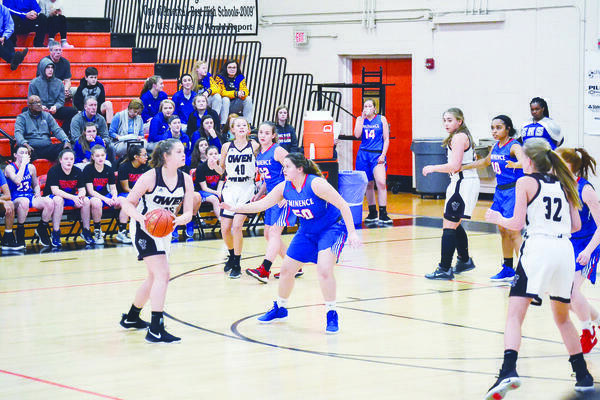 Despite coming ahead for the lead several times throughout the game, the Lady Rebels fell short of the win, scoring 55 points to Walton-Verona’s 62. Moore led the scoring with 23 points. Woodyard scored 17 points. Ferguson came off the bench early in the game scoring 10 points and pulling down nine rebounds. Epperson found herself on the bench in foul trouble early in the first quarter and managed only four points and six rebounds for the game. 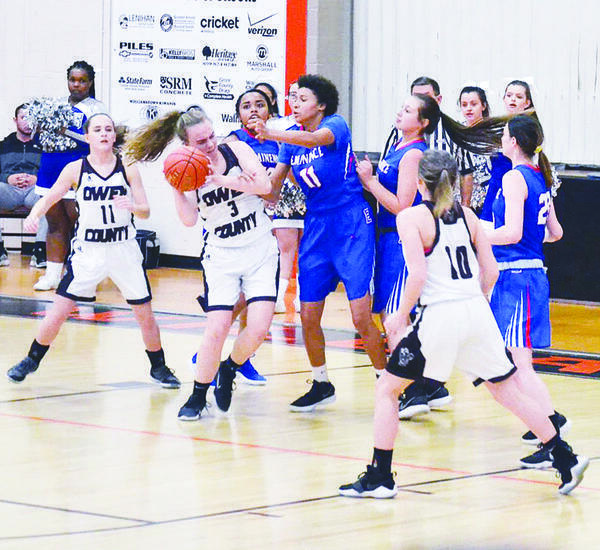 The Lady Rebels will be back in action today, Wednesday, Jan. 16, against Henry County at home. Tip-off is set for 7:30 p.m.
On Friday, Jan. 18, the Lady Rebels will travel to Warsaw to take on Gallatin County. Tip-off is set for 7:30 p.m.